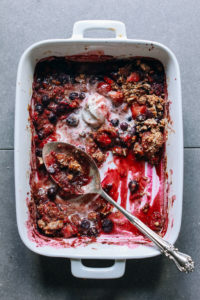 My neighbour Agnes recently invited me over for a cup of tea and had some of this delicious crumble waiting for me alongside the tea. It was so delicious that I had to ask for the recipe. It’s really easy to make, contains no gluten and you can make it dairy-free by using coconut oil instead of the butter (but the butter does make it taste delicious, have to say). It’s an extremely versatile recipe and you can use whatever nuts, seeds or fruit combo you like but this combination was particularly yummy. 1 heaped tablespoons of mixed berries, whatever is in season. Frozen organic berries are fine to use here as well. a handful of pinenuts and walnuts roughly chopped. You can use a mix of other nuts and seeds of your liking but I found that this combo was really tasty. You can also mix together some oat flakes and almond flour together with the nuts if you want some additional crunch. Mix all the fruit together in a rectangular oven dish. Mix the maple syrup and spices with the nuts in a small bowl and add to fruit. Mix everything well together. Cook 20 minutes at 180 degrees. You can eat it as is or add to a bit of yogurt on the side. It’s also a great combo to add to porridge in the mornings and makes a very satisfying and low sugar dessert for those people who want to end meals on a sweet note.